This review was slightly delayed as I had a bad dermatitis reaction on my face to a different product I was using that was just a bit too strong for my face. Finally, the review is here! 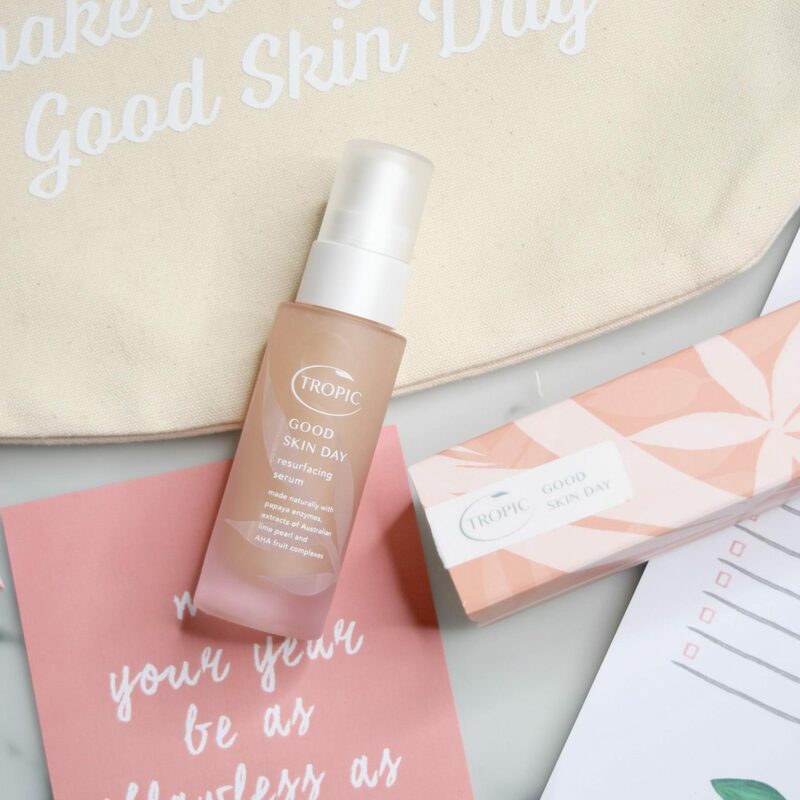 What is Tropic Skincare Good Skin Day? Good Skin Day is a restorative facial serum that resurfaces the top layer of skin to reveal a brighter, more youthful looking complexion overnight. It’s for use after cleansing and toning and before facial oil or moisturiser. If you are exhausted with grey looking skin, uneven skin texture or have a bad skin tone. If you’ve got visible large pores that need a good cleaning from the inside out and if you are feeling and looking drab with your skin lacking a glow. Good skin day contains Australian lime pearl which is an Alpha hydroxy acid. AHA’s have been shown to produce increased amounts of collagen and increased skin thickness without detectable inflammation. It also contains willow bark extract which is a beta hydroxy acid. BHA’s primary use is as an exfoliant to help shed dead skin, it exfoliates inside the pore as well as the surface of the skin which is great for reducing breakouts including blackheads and whiteheads. In addition to these benefits, BHA’s have soothing properties to calm aggravated skin and can help minimize the appearance of an uneven skin tone. The Good Skin Day serum also includes papaya enzymes and probiotics and concentrated hyaluronic acid which hydrate and plump up skin cells and as we know, hydrated skin looks more youthful. My skin has been feeling a lot softer and smoother. Finally! I am a botox devotee, so I can’t tell you exactly how youthful this would make you look by itself. But my skin definitely looks plumped up the morning after using. This, in turn, makes my foundation application easier and the finish much smoother. The best thing about this serum is the glow it gives you, my skin looks really clean clear and full of life, rather than dry and dull. If you haven’t tried any products by Tropic Skincare I will say this. They blew me away with how good they were, especially as, if I am honest I didn’t expect to be impressed. All of the products are vegan and cruelty free too! Available here, for £42.00, or through your local Tropic Ambassador.